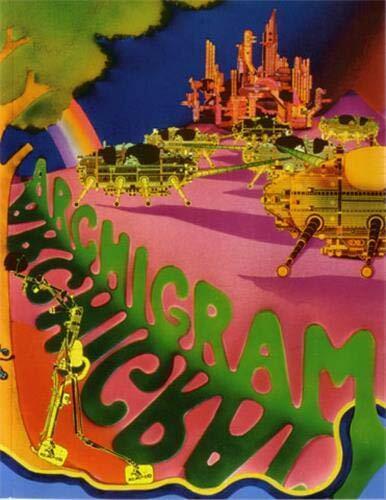 Archigram was an avant-garde architectural group formed in the 1960s and based at the Architectural Association, London that was futurist, anti-heroic and pro-consumerist, drawing inspiration from technology in order to create a new reality that was solely expressed through hypothetical projects. The main members of the group were Peter Cook, Warren Chalk, Ron Herron, Dennis Crompton, Michael Webb and David Greene. The pamphlet 'Archigram I' brought out in 1961 proclaimed their ideas. Committed to a 'high tech', light weight, infrastructural approach that was focussed towards survival technology, the group experimented with clip-on technology, throwaway environment, space capsules and mass-consumer imagery. Their works offered a seductive vision of a glamorous future machine age, however social and environmental issues were left unaddressed. The works of Archigram had a Futurist slant being influenced by Antonio Sant' Elia's works. Buckminster Fuller was also an important source of inspiration. The works of Archigram served as a source of inspiration for later works such as the High tech 'Pompidou centre'  by Renzo Piano, Richard Rogers and Gianfranco Franchini. Some famous projects of Archigram are Ron Herron's "Walking Cities" and Peter Cook's "Plug-in-City", both of 1964. Plug-in-City is a megastructure with no buildings but just a massive framework into which dwellings in the form of cells or standardised components could be slotted into. The machine had taken over and people were the raw material being processed, the difference being that people are meant to enjoy the experience. "In late 1960, in various flats in Hampstead, a loose group of people started to meet: to criticize projects, to concoct letters to the press, to make competition projects, and generally prop one another up against the boredom of working in London architectural offices. The main British magazines of the time did not publish student work and Archigram was responding to this as much as to the sterility of the scene. The title Archigram came from the notion of a more simple and urgent item than a Journal, like a telegram or aerogramme - hence, "archi(tecture)-gram."" --BOOK JACKET. "This facsimile edition of a book originally published in 1972 is a chronicle of the work of Archigram as told by the members themselves. It includes material published in early issues of the Journal, as well as numerous essays, comics, collages, poems, and fantastical architecture projects. The book is updated with a new introduction from longtime member Mike "Spider" Webb." --BOOK JACKET.